Hashtags, the widely used convention to find tweets on a particular topic, are the stars of a new TV ad campaign from Twitter. This is the first time the social network placed TV spots and they were first aired at the weekend on Time Warner’s TNT channel, during Nascar’s 2012 Pocono 400 race. Twitter created a total of seven 16-second spots for the event. They show racecar drivers, technical staff or attendees posting photos on the social network as a means to promote the new hashtag pages Twitter introduced last week. All the ads point viewers to the Twitter.com/#Nascar page, which redirects to twitter.com/hashtag/nascar. The page aggregates through a combination of algorithms and curation relevant tweets and photos posted using the hashtag, giving importance to those coming from the race drivers and attendees. Although many TV shows now use hashtags to generate conversation, the hashtag page is different from simply searching for a term using Twitter search because you get relevant tweets, not only the latest postings. 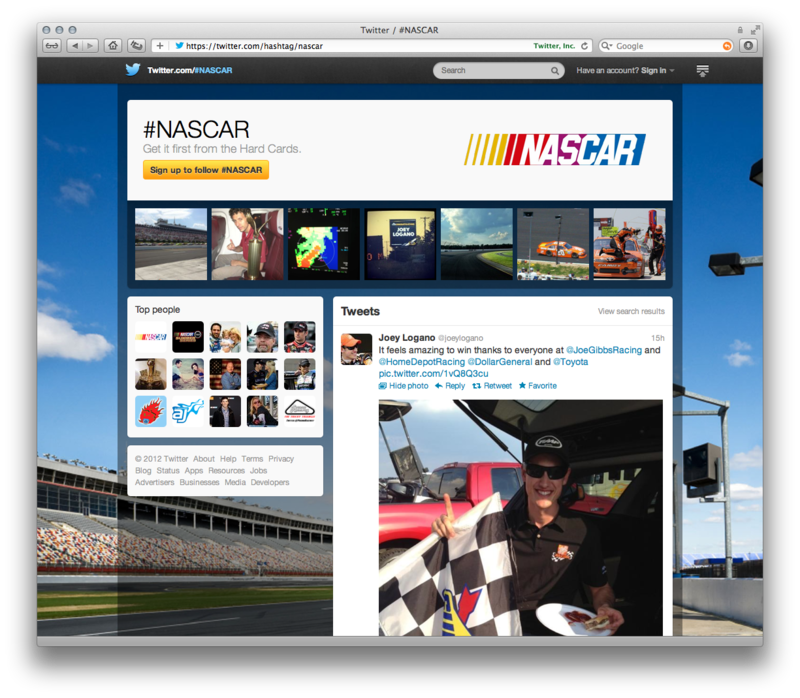 Also, if you click on the #NASCAR hashtag anywhere on the Web version of Twitter, you will be taken to the special page. So far the Nascar hashtag page seems to be a one-off -- Twitter does not appear to have set up a hashtag page for other events, such as Apple’s WWDC developer conference today, for example. But its use is perhaps an indication of how Twitter is looking at expanding offers for advertisers, who can now buy only promoted tweets.